If you want to secure the perimeter of your deck, insuring a waterproof seal, you must dial in the metal edges. Prestige Deck Coating knows how crucial properly installed deck waterproofing flashing is to guarantee that your patio, balcony, or roof deck is waterproofed. 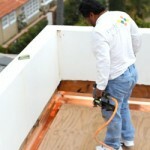 At Prestige Deck Coating, we use 24 gauge bonderized metal deck waterproofing flashing to insure strength and proper flex for your Orange County deck waterproofing foundations. The flashing is fitted tightly against the corners of the deck, then we generously apply industry grade caulking. We leave no corner uncaulked! Not only do we caulk any potential pin prick holes that attract any pesky water seepage, we reinforce our metalwork with an ingenious overlap technique. Note in the picture to the left, that our expert installers overlap the flash to double its waterproofing potential. Proper flashing installation is key to avoiding future deck leaks. Any holes in the metal are eliminated, and a snug fit into the corners is achieved. We at Prestige, secure the perimeter! Next, we adhere the metal flash to the deck subfloor. This is done in two ways. Caulking in applied behind and metal both on the subfloor and the wall. Second, the flashing is secured to the wall and subfloor with industry grade nails, one per six inches. Each overlap on the metalwork and possible hole is sealed with caulking to insure waterproofing. Prestige Deck Coating leaves no hole unplugged, no corner exposed. Deck waterproofing flashing begin with proper metal installation. For those who live close to the ocean and its saltwater air that encourages rust, Prestige offers a solid solution. We suggest using stainless steel deck waterproofing flashing in order to war against premature rust and a compromised deck waterproofing foundation for your deck. 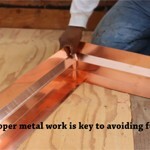 This metal works better than even copper, which can clash with other types of metal, accelerating rust. Whether bonderized metal or stainless steel, your deck waterproofing foundations are destined for successful sealing. Prestige Deck Coating will enable you to assess the condition of your deck waterproofing flashing and will solve the problems before they begin or after they are identified. Either way, you are safe in our hands! Welcome the rain which will only end up in your drain, lessening the strain on your brain due to stress of leaking deck waterproofing foundations. 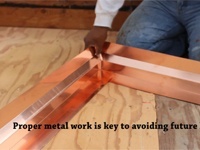 Proper metal installation is the key step in waterproofing your deck.